Can you share a bit about your unique career journey? I had the unique pleasure of knowing what I wanted to do for a living at a very young age and was first published in a national magazine when I was 12. In my senior year of high school I was already working professionally as an commercial artist. By the time I was 25, I was way ahead of my peers in terms of experience and became a creative hired gun for many Fortune 500 companies including Disney, Toshiba, Apple, Isuzu, Pioneer Electronics and IBM just to name a few. I specialized in Internal Human Resources Benefits Communications and Employee Morale Collateral (that's a mouthful of words for HR Design) for these companies both directly and indirectly through consulting firms. This is where I learned to communicate to large groups of people in a fun and friendly way—and in many instances with humor. It was my job to catch the eye of the employee base so that they would not only look at their benefits materials but also act on them. After all, who wants to read about their health insurance plan? Eventually, the internet starting taking a bite out of my print work, so I got into animation and web work. One of my animations was inducted into The Museum Of Radio and Television archives, which helped me procure a Hollywood literary agent and gave me the writing bug! As all things come full circle, the recession forced me to look elsewhere for additional income and I turned to sales. I applied what I learned from my design career to sales (without realizing that my lack of experience was really breaking the rules and therefore worked) and this lead me to a leadership position of over 500,000 people around the globe. This was the beginning seed to the book. 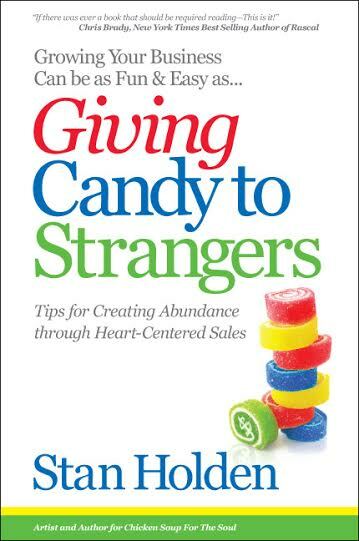 When and how did the idea to write Giving Candy to Strangers come about? Review & Giveaway - HERE! As a professional artist most of my career, it occurred to me that there are not a lot of business books written by artists (and for good reason, many of us are flakey and not necessarily good at business)! I took a long look at the successful design studio I ran for years and realized that one of the major reasons I succeeded was not because I was such a great designer... but, because I was a connector, I was easy and fun to work with and I enjoyed helping my clients (and competition). I had written a few stories for Chicken Soup For The Soul and thought that a business book written with more sentiment and emotion (from the perspective of an artist) was needed. I also realized that as an artist I tend to do things outside of the box... why not apply and teach that to others as it applies to business and relationships in a practical way? 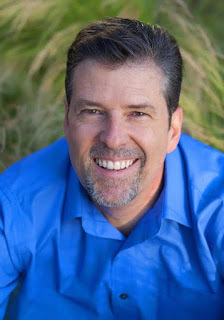 Many of my advertising agency clients would come to me for conceptual writing and fresh ideas. I would create catchy headlines, ideas and concepts for campaigns that their internal creative people would take and then expand on. I am fond of "double entendres" and playing with words, so I wanted a title that would make people think and then be attracted to. In this case, I took what is normally seen as a negative (Taking Candy From Strangers) and turned it around into a positive, Giving Candy To Strangers. This is also the core philosophy of the book—turning things around and giving! As a side note to that, as a visual designer I created the cover of the book before I ever wrote a word. 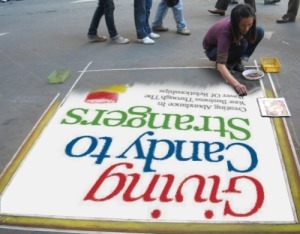 Normally, you do not design your own cover... much less do it before the book is written. But I like to do things differently. How did you approach the writing process - daily schedule, as inspiration hit, etc.? I am notorious for always thinking, it's a blessing and a curse, but years of being a professional creative taught me how to turn on and turn off at will. When I was working on a design campaign I would lay on my couch and daydream... and I would think to myself, "I can't believe I am getting paid for this." I started to do the same thing with my writing (only I would keep a notepad close by). Hiking and long walks are also a great source for inspiration. Procrastination, believe it or not can be a great tool... when am backed up into a corner I sometimes come up with my greatest ideas. I do not recommend that everyone wait until April 13th to do their taxes, I am merely pointing out that what works for some may not work for others. You have to know what works for you. I realize that not everyone can do this, but I do believe that we all have a creative side within us and we are the closest to our creator when we are creating. You can apply creativity to any situation. Heart-led is a phrase I am seeing a lot lately. What does heart-led mean to you and how did you come to incorporate it into your business? Easy answer, it's the most important part and the beginning of everything! It is where all ideas and creation start. Whether it be choosing to do something creatively or creating a new relationship. Einstein said, "Imagination is more important than knowledge." Even as a scientist he understood this. It all starts in the heart, including imagination, and then moves to your head. Apple computer understands this at a deep level. Their products fill a need at an emotional level before a practical level. I have had the pleasure of working on many projects for Apple and that philosophy permeates throughout the entire company... from accounting, to marketing. You have to move people to move business and that starts with the heart. While there are many great ideas to consider in your book, is there one in particular you hope all readers walk away with? Picasso once said that it took him four years to learn to draw like Rafael but a lifetime to draw like a child. Let your hair down and play in the sand box just like a kid! The reason sales came easy to me is twofold: first I expressed my playful artist side and applied it to sales and secondly, I didn't know any better as to what not to do. My lack of experience became a blessing because I tried and did things that experience would have told me not to do. Be childlike, figuratively speaking, let down your guard and run amuck. Yes, yes and yes. My next book called "Don't Lie Down In The Aisle" will be about persistence and resilience and will be written in the same vain as Giving Candy To Strangers. Sales can be 24/7 career that is hard to step away from. How do you make sure you take time off and when you do - what is your favorite way to relax? The $60,000 question. That is the whole point of my book... I do three things, get solitude, spend time with friends, then I go out and spend time Giving Candy To Strangers, all of which take many forms through various situations. When you have the right attitude about other people, sales and relationship building it's not work. It is creation. In closing, can you share a quote that hits the mark for you personally?